It was a card that promised much and above my expectations it managed to deliver on the majority of those promises, with each match more or less getting the time they deserved. It’s only detractor being the main event couldn’t quite live up to what had gone before it. As a regular pay-per-view main event, this match probably would have been good enough match. However on a night of epic contests throughout the show, there just wasn’t enough substance in this match to end the pay-per-view on a high note. We kicked off on with the first fall which was a Lumberjack Match. It was slow start for the match and didn’t really help get the crowd onto Cena or Ryback’s side with them content to chant for other wrestlers for most of the contest. There was a nice spot with Cena jumping onto all the Lumberjacks from the top rope, which lead to the finish with Ryback hitting a Shellshock for the first fall, but apart from that this match was basically a throwaway Raw main event. The contest upped a little with the second fall, a table match. With the steel stairs being quickly incorporated into the contest with Cena dodging Ryback’s attack twice sending the steel through the tables, the sense of danger was certainly upped here, although not quite as high as previous Three Stages of Hell contests. The match was well paced, and Ryback even managed to derail the regular Cena comeback with a Spinebuster, before Cena slipped out of a Shellshocked attempt to AA Ryback through the table. With Ryback essentially no selling going through the table to help keep him looking strong, we headed into the final fall of the match which would turn out to be the best. The match started with Ryback power bombing Cena through the announce table, forcing the contest to up it’s game from this point forward and for the most part it did. The rest of the bout revolved completely around the use of the ambulance, with a number of decent spots once Ryback had carried Cena up the entrance ramp. Parts of the ambulance were broken off and used including parts of the body work and a crazy amount of crutches. The most impressive spot saw Cena irish whipped Ryback into an open door, which came clean off, which looked really good on screen. There was an awkward moment with Ryback not quite being close enough to the ambulance when going for a powerbomb, and the resulting back body drop look painful. The finish was something that probably sounded good in a meeting and on paper should have worked, but in practice, seeing Cena AA Ryback through what looked like the paper roof of the Ambulance didn’t quite work, mainly because you could see how the roof was rigged up earlier in the contest. Cena’s win is a sensible one by WWE, as Ryback’s heel turn hasn’t quite been as successful as they would have hoped and handing him the WWE title wouldn’t have helped changed this. He needs to improve on his microphone skills if he’s going to get any investment from the fans in his storylines, or at least partner up with some who can speak for him. I’m not quite sure where WWE will go with Ryback from here as the amount of losses he’s suffered when it matters haven’t exactly built him as the indestructible monster they refer to him as. I’d expect Cena to hold the WWE Championship for a while yet, mainly because no else seems quite ready to step up and it will be interesting to see who gets the nod to face him at Money in the Bank. CM Punk in Chicago. That’s all you need to know to realise how huge the crowd reaction to the Voice of Voiceless was here, add in the fact that Punk hadn’t been seen on television for two months and you had some really special. From the moment Cult of Personality hit to the final ring bell the crowd were red hot for this one all the way through. Punk walking out in his hometown had a real epic moment feel and it was great to see him back on WWE Television. The opening of the match however couldn’t quite live up to this epic reaction. As is usual with CM Punk’s longer matches, it takes a while for him to warm up and feel his way into the contest, similar could be said for his opponent Chris Jericho. The two exchanged holds for the first five or six minutes, with a number of submission holds which were well put together, bar an awkward armbar for Punk, and built the foundation for what the match would become. It was a slow start but one that was needed for such a hotly anticipated contest. The match really got going once Punk answered a charging Jericho with a knee to the face and headed to the apron. Punk took his time, looking around the entire arena and you could just feel that the pace of the match was about to up itself. With both men spending what felt like an age in each other’s submission holds, with a lovely transition from the Walls of Jericho into the Anaconda Vise, the selling ability of both men really made these moments feel like they could finish the match, with Jericho in particularly doing a great job in the Vise, before reaching the ropes. With each fall of the match adding a newer layer onto this match, made even better by both men managing to make those near falls look like they were going to end the match, like a really tight roll up from Jericho with Punk kicking out at the very last moment. With Jericho kicking out of the GTS, and Punk looking to the Chicago crowd for inspiration, this was a real spine tingling moment when watching live, as you could really feel the emotion of both Punk and the entire of Chicago emanating through the television screen. With too many spots to mention here, the finish saw Punk fight out of the Walls of Jericho, to hit not one but two GTS for the victory. It was a great finish to great contest, with both men playing their roles well throughout. I’m interested to see where both men go from here, hopefully Punk will return to television full time as his presence alone would certainly help with Raw. As for Jericho, he won’t really be harmed by this loss as it was a competitive contest, I could see Jericho going into a feud with Curtis Axel around the Intercontinental Championship, which could be a good contest and help Axel get over more with the WWE Universe, as well as Jericho being a record setting Intercontinental Champion playing well into this potential storyline. Considering this match essentially only had a week of build-up due to Ziggler being off television with a concussion, this contest managed to tell an unbelievable story, whilst also being a sound technical contest. With Ziggler starting the match as a heel, even going as far as to leave the ring when things didn’t go his way at the start of the contest, things were about to change as these two wrestlers took the viewer on an incredible journey through the match and it’s aftermath. The match started off regularly enough with the two exchanging holds and irish whips, until Del Rio hit a big punch on Ziggler and it really got interesting. From this point onwards Del Rio dominated with Ziggler offense limited to a number of spots. With Del Rio showing a much more vicious side than we have come to expect from his recent face run, as he focussed almost solely on Ziggler’s head, including smashing Ziggler’s head into the announce table after Ziggler had taken a crazy bump to the outside. It was about this point in the match were the roles began to switch, with Big E Langston trying to protect his friend, only for Del Rio to push him, once Langston fought back he was ejected from the arena to loud boos from the crowd in the Allstate Arena. Ziggler’s fantastic selling ability really made this match, as it was easy for the crowd and audience at home to begin to get behind Ziggler when they could see he was hurt but still trying to fight. Whilst Del Rio’s facial expressions whilst in control were also a big part in telling the story of this one. After Ziggler refused help from the doctor and AJ Lee, it really did cement his new role as a fan favourite, with Del Rio taking advantage pushing it even more. Every Ziggler comeback felt important and a last gasp attempt to keep his title. With Del Rio gloating and laughing at Ziggler, Dolph surprised everyone by hitting a Zig Zag, but unable to capitalize The Show-Off got struck by a Superkick and we had a new World Heavyweight Champion. It was superb ending that felt fitting for the contest, although I hope Ziggler will be getting his title back soon. It really is something in todays modern age of wrestling and the internet, that match is able to tell such a fantastic story and have even the smarkiest of fans willing on Ziggler to turn the contest around. Although it seemed a strange decision to take the title of Ziggler after leaving it on him for his five weeks of television, the title change made sense when put in context of the match. This rivalry certainly has the legs to keep going for a long time and I’d expect to see a big payoff come Summerslam. There was also a Tag Team Championship match between The Shield’s Seth Rollins & Roman Reigns and Team RK-No. This match was another slow burner which suffered in terms of crowd reaction being place directly after the match between Chris Jericho and CM Punk. Randy Orton dominated the opening of the contest taking control of Seth Rollins, including a good looking version of his regular slam, this time with Rollins flying from the top rope. With The Shield eventually gaining control of Orton, wearing him down with a number of submissions, it did become a little slow during this part of the match, with the crowd not caring enough about Orton to will him into a comeback. When the comeback came it looked to be going well with Orton’s usual crisp style, until he botched a T-Bone suplex on Rollins, where Rollins was meant to connect with Reigns in the corner, but with Orton too far away it didn’t quite reach and looked messy. After the hot tag to Daniel Bryan this match really came alive, as the pace lifted and as well as the game of all four competitors. The tension between Bryan and Orton was teased as Bryan flew through the ropes only for The Shield to move out of the way and for Bryan to clatter into Orton. Then followed some great chain wrestling from Bryan and Rollins, with a crazy butterfly superplex from Bryan and The Submission Specialist locking in the No Lock numerous times only to be thwarted by Reigns. Once Orton recovered the four headed for the finish, with Orton almost crashing into Bryan, before The Viper side stepped Reigns’ spear and Bryan got clattered. Orton then took out Reigns with an RKO, before he was dispatched of by Rollins. Rollins got the victory for his team with a Blackout on Bryan. It was another great finish to a Shield match, although this probably won’t go down as one of their best contests in WWE. The Intercontinental Championship was also on the line in a triple threat contest with Preston’s Wade Barrett defending against The Miz and Curtis Axel. The opening of the contest was good with some nice wrestling by all three guys, although it focused a little too heavily on one on one action in various combinations. It was once this match started to toy with the triple threat concept that it really got going. There was nice spot where Barrett went for a Wasteland on Axel and took out The Miz in the process, with Axel getting free and hitting a Perfect Plex for a near fall. The ending saw some really good work from all three men, with The Miz very impressive as he set up the Figure Four Leg Lock in another innovative way. With Barrett holding in the Leg Lock for a very long time, selling well, it really helped to raise his profile during the match, and when Axel slid in to steal a pinfall and the title, it didn’t particularly harm Barrett as he had looked so strong in the hold. An emotional moment for Axel followed as he looked to the sky, referencing his father Mr. Perfect on Father’s Day. After the match Axel was spotted backstage in a segment with Triple H and Vince McMahon, in which it was teased Triple H might get a shot at Axel’s title, although Triple H is now strangely reluctant. Kaitlyn and AJ Lee put on one of the best Diva’s Championship matches in a very long. The bout was hard hitting from the outset, with AJ sent flying over the announce table and then delivering a vicious drop kick to Kaitlyn on the outside. Kaitlyn’s development was also handled well with her looking strong by staying in AJ’s Black Widow and selling fairly well. With Kaitlyn looking like she might have the win after a thunderous spear, she took her time to blow a kiss to AJ and only got a two count. It was great to see an actual storyline in a Diva’s match and it really added to the contest, allowing for an emotional investment in the characters. With Kaitlyn back in the Widow’s Peak one more time, she attempted to fight out but eventually had to tap out for the finish, as AJ won the Diva’s Championship. The United States Championship Match between The Shield’s Dean Ambrose and Kane was a solid contest technically, but never really got out of the starting gates, despite being ten minutes long. The early part of the match was slow as it seemed to be building as a number of matches on the card did throughout the night, however when the match looked to picking up it’s pace it was quickly over. With Ambrose and Kane on the outside, Ambrose slapped the Big Red Monster who went into a rage removing the lid from the announce table. With Ambrose reversing Kane’s chokeslam into a DDT for the Countout victory, it was another frustrating match between Ambrose and Kane, as it was a good match, but it could have been even better, if a number of constraints were removed, such as time. It would be great to see these two go at it for a good fifteen minutes in a Falls Count Anywhere contest, it would have the potential to be an absolute classic. The Payback Kick-Off contest was Sheamus against Damien Sandow. I was surprised by how long this contest got on the Pre-Show and it really did benefit from being longer than five minutes. I was also pleasantly surprised by the booking of Damien Sandow throughout the contest as he controlled a lot of the match and looked impressive throughout, nearly winning with his old finishing neckbreaker. The ending saw Sheamus hit three stiff looking Irish Curse Backbreakers, before setting up the Brogue Kick for the victory. It was a good way to start the show, as a much more serious side of Sheamus allowed for some hard-hitting action that warmed the crowd up well. Damien Sandow also looked strong as it took so much offense from Sheamus to get the victory, hopefully this booking of Sandow continues going forward. What have we learned from WWE Payback? 1. Chicago isn't afraid of letting WWE know how they feel! 2. The Three Stages of Hell Match, probably could have just been an Ambulance Match, allowing Punk/Jericho to go on last. 3. Dolph Ziggler should make a fantastic sympathetic face, whilst Del Rio looks a lot more comfortable as a heel. 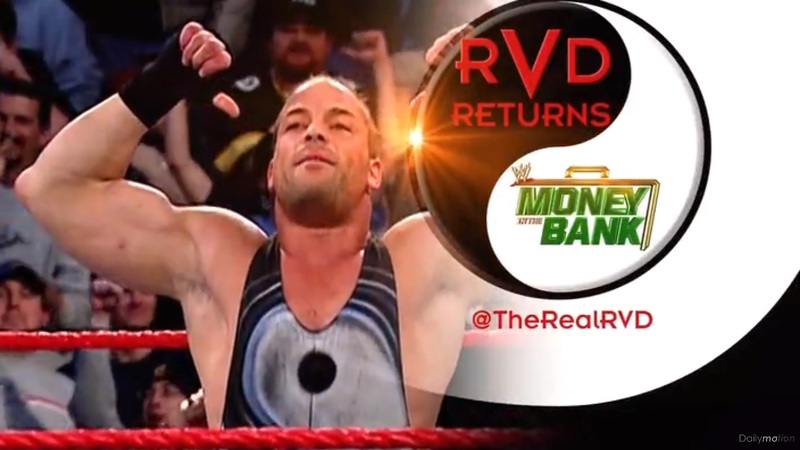 The return of Rob Van Dam.